Widely used landscaping plant Lomandra longifolia has the common name of Spiny head Mat Rush, it is a clumping grass with mid green strap like leaves. Flowering in spring, slightly fragrant cream flower heads followed by seeds. 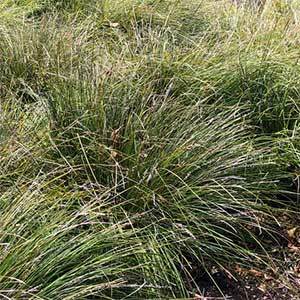 Lomandra is widely used in roadside plantings where erosion control is a concern. Pictured right is the species Lomandra longifolia ‘Tanika’ growing in a natural habitat. It does form a good rounded clump over time and in a landscaping situation with adequate moisture will maintain a lush green appearance year round. Well suited to coastal conditions where it will cope well with wind and salt. Fast growing and excellent for erosion control. Lomandra longifolia is hardy Australian native which is adaptable to a wide range of soils and growing conditions, dry to damp soils, sun to part shade and poor soils as well. However ideal growing conditions will enhance the growth. 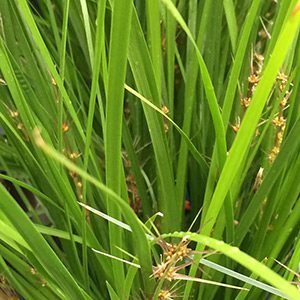 This is an ornamental grass that will grow well in containers and provides a low maintenance solution to many landscaping and mass planting situations. Prepare the soil sell by digging over, added humus is beneficial, however not always required. Plants will require water for the first 2 – 3 months depending on the time of the year, be vigilant if planting during dry conditions. Once established they are very drought tolerant. Slow release fertiliser in spring will enhance growth. Although plants can be left virtually untouched they do benefit from a good cut back after 4 – 5 years. Simply cut back to around 30cm from the ground in mid late winter. We have done this with a brush cutter, and then raked up the excess. The flower heads will set fruit and the seed can be collected when they have turned a brown colour on the plant. Some cultivars are sterile and will not set seed. Sow seed when fresh in a tray and keep moist, germination should occur in around 1 – 2 months. Transplant to larger containers when the seedlings are large enough to handle, checking first that the root system has developed. Keep moist on transplanting.